This owner-producer cultivates 840 hectares of 20-60 year old vines in Champagne’s Marne Valley. Today, the estate is farmed following the principles of biodynamics. This respect for the vine and its environment favours the exchanges of nutrients between the ground and the plant’s root system thus realizing the maximum expression of terroir in the wines. This cuvée is a Blanc de Noirs blend of 80% Pinot Meunier grapes, providing suppleness and fruitiness and 20% Pinot Noir for body, strength and attractive red berry aromas. 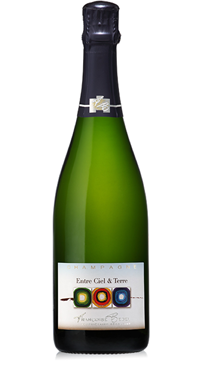 The Champagne has a vibrant citrus edge with good minerality. Brioche, honey and subtle roasted notes play out on the long finish. We celebrated the birth of a new baby yesterday with this beautiful, smooth champagne. Big thanks to the staff member who explained champagnes to me and helped me choose this!